Join me for a Connemara Coast workshop. It takes place on Saturday, July 6th. We usually meet up about 1pm. 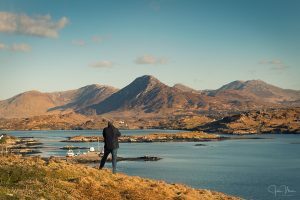 Then we will drive out to chosen locations to photograph along the Connemara coastline and some inland landscape. Together, the group will visit well-known locations as well as some lesser-known ones. We would be stopping at 3/4 different places or more if time allows. The workshop will conclude shortly after sunset. I will drive us all from wherever we meet up so it’s not necessary to have a car for the entire day. I will cover all aspects of landscape photography including shooting in manual mode, using filters, composition and a little long exposure if people want it. It’s not necessary to have filters as I have spare ones on the day. The cost is €120 per person. I may request a deposit of €60 a month beforehand to secure your place on the workshop. The remainder can be paid on the day. The workshop is limited to 3 people. It will be an ideal opportunity for you or your camera club friends to bring your landscape photography to the next level. This workshop is nearly finalised and is subject to change. If you are interested in this or want some more details, feel free to contact me.